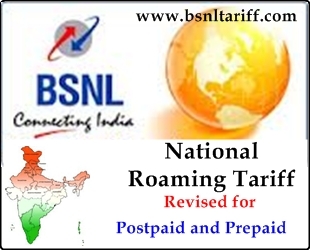 Bharat Sanchar Nigam Limited (BSNL) South Telecom Kerala Circle has announced Rationalization of National Roaming Tariff under both Prepaid and Postpaid Mobile Services to comply with ‘The Telecommunication Tariff’. The Competent Authority of BSNL Kerala Telecom has decided to Revise National Roaming Tariff for Incoming call from Rs.1/- to Rs.0.75/- and for Local SMS in National Roaming from Rs.1.50/SMS to Rs.1/SMS under both Prepaid and Postpaid Mobile Services across Kerala Circle. Note: The incoming call charges in Prepaid ‘Roam Free’ Plan while in roaming will be charged ‘0’ (NIL) for BSNL Roaming area and ‘0.75’ for roaming in MTNL area and Rs.0.05/sec for incoming video call will be charged. The above Rationalization of Roaming Tariff will be implemented and with effect from 09-07-2013. All other terms and conditions along with other tariffs will remain the same.